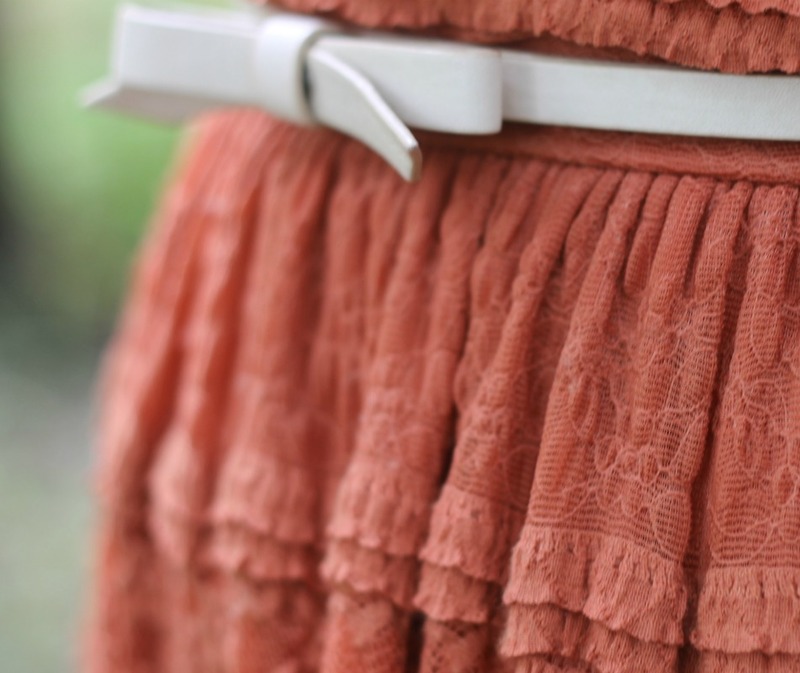 Lace Orange Dress: Fig Leaf. Pearl Bracelets, Bow Belt: Forever21. I finished up going to all of my new classes today and I have to say I am very pleased with my schedule this semester. I don't really have any class I dislike yet, but feel very excited about all of them! I went to Fabrics today which I think I'm going to love (and would love it even more if it wasn't so early in the morning, eugh). It's a lab and lecture learning from top to bottom about all fabrics. Yawn for most people, but I'm lame and find it interesting. I also went to child psychology and college writing today; both were fantastic! To be honest, I was dreading college writing because although I enjoy writing, I am not one to like papers and such. The professor is literally THE COOLEST one I've ever had though. Seriously, she is my dream professor and I have a major girl crush on her. Although school and classes are going well, one thing really kind of upset my day. Since I started my OCD medication back in my senior year of high school, a huge side effect is drowsiness. I would come home from high school and sleep for five hours and still be tired when I went to bed. The side effects have still not worn off, even though they are supposed to lessen with time, and I had a rough time last year, as well. I was constantly taking naps between classes just to feel better. I was hoping this year I would be able to cope better, but I ended up sleeping for three and a half hours this evening on accident. It's so upsetting because I feel lazy and like I waste so much time that I could be working. It also makes me so frustrated because I could have been spending that time with friends, making new ones, or just enjoying this time at Kent now that I'm back. Instead I was locked in my dorm sleeping? It's incredibly upsetting to me and I don't want this to be a sign at how the rest of the year will go. Do you all have any good suggestions on fighting drowsiness and staying awake? I would say coffee, but to be honest coffee has the opposite effect on me and makes me even sleepier. Any help would be so, so appreciated! Maybe try apples? I don't take OCD medication, but I've heard that apples wake you up even more so than coffee does. Plus they're yummy and make your teeth feel nice. Glad to hear your classes are going to be fun! :) I can't wait to see all the cool fashion projects you'll get to do. Don't worry about one day :). Transitions are hard, and while it could have been your meds, it might also have been being thrown back into school. First days are crazy and soooo tiring. You've got tomorrow and the rest of the year to make up for sleeping today. Take care and enjoy! Your classes sound super fun! So Hannah being Hannah, I did some research of food that give you energy because I had heard what Lauren said about apples before (several sites agreed that apples have nutrients that will help boost your energy levels). A lot of sites said Dark Chocolate (like really, really dark) because it has certain nutrients that help with your energy and focus. Also make sure you aren't dehydrated or have low blood sugar. I almost passed out in Pittsburgh because of those two things. Some people swear by aromatherapy and though I've never used it for energy I've heard great things about it and Bath and Body Works has it's own aromatherapy collection. Personally if I need to stay awake I drink green tea and go for a walk. Walking seems to solve everything for me. I need to send you a care package while you're there. Yeah, that needs to happen. I know how you feel with regards meds sigh. I'm on half the 'normal' dose and I'm still out cold. Trying to do anything is virtually impossible :(. Sorry I don't really have any ideas that will help to keep you awake, but my mam has something called CFS which means she is always tired like always no matter how much sleep she gets or how little. What she has to do is something called pacing. Basically as she cannot fight the tiredness she has to choose what to do and prioritize so it might be something like classes for you are number one you have to do them, socializing is great but not as important, also your true friends will understand if perhaps to spend time with them you just need to sit and chill in their company rather than always going out and doing new and exciting things. Sometimes the hardest thing to learn is when to say to yourself that you need time just to stop and relax. Try not to push yourself too hard as you do tend to be hard on yourself, and be grateful for what you can and have done rather than what you can't or haven't. Take that from someone who would love to even have the energy to attend a college or have a summer job but can't :(. Gosh I've written an essay sorry about that and I hope I haven't made you feel guilty or bad. I'm so sorry to hear your medication makes you feel so drowsy - lately I have been super tired and unproductive too; it's so so upsetting! I'm afraid I haven't found a solution, but I really hope you can find one soon! First and foremost, this is such a cute outfit. I love the dress with the oxfords. 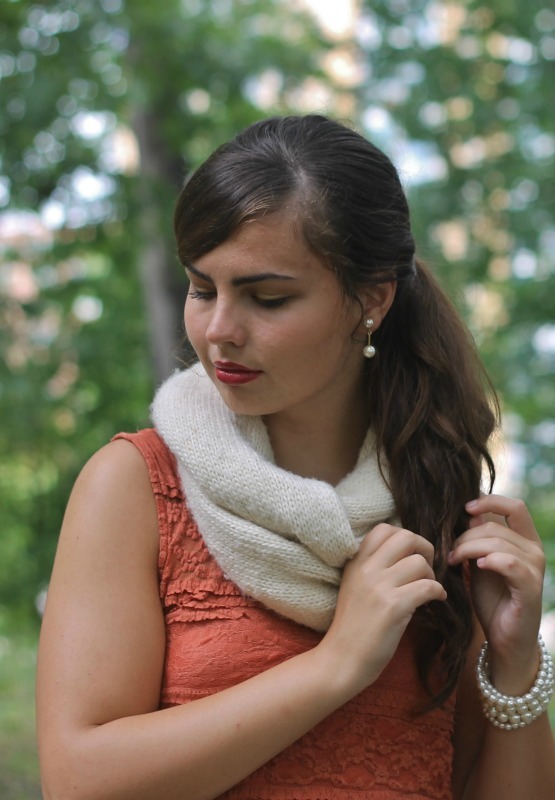 And, that infinity scarf screams fall! I used to take a medication that made me fall asleep in high school. Such a horrible experience. I tried everything to stay awake, and nothing worked. But, I noticed that when I ate peanut butter on apples, I would feel instantly energized. I don't take the medication anymore, but I do have a retail job where I work early morning hours, and the trick still works. I don't like peanut butter, but peanuts themselves have protein and the enzyme Coq10, which are great sources of energy. And, apples are sugary and delicious! I hope this helps you a little! For me, exercising just a few days a week boosts my energy levels for the whole week. Just make sure it raises your heart-rate (aerobic). Say a 15-20 min. run or jump rope, and that's all it takes for more energy for me. Hope it helps! I'm lame too, and I find all this interesting. Here are a few things my Dr suggested when I was having problems sleeping as in at all the wrong times and too much, maybe they'll help you. 1. Always have a night time routine go to bed at around the same time every night and wind down in the same way eg warm milky drink read whatever but do the same thing every night. 2. Always get up at the same time, no matter if it is a weekend or a day off this will help with number 1 as well as it'll help you fall asleep at night. 3. If you don't fall asleep within 20 mins of going to bed get up and do something calming eg reading (I used to get all of my best homework and set reading done at this point) basically you want to keep your bed only for sleeping and nothing stimulating like blogging or searching the internet in bed. 4. If you do have to nap set an alarm clock to wake yourself up so you don't end up sleeping for hours and then not being able to sleep at night. I don't know if any of this will help but for me it made a difference I still have to nap but I can at least sleep at night and function (sort of) through out the day. Hope you find something to help you. Such a beauuuutiful color on you! This year I've taken a huge initiative to work out for about 45 minutes a day, and I've noticed a drastic change in my energy level. Doing pilates and yoga instantly makes me feel more positive, alive, and awake! So maybe try doing some fun workout videos? i always love your outfits ! Thank you once again for that conversation . If you like my blog you can visit here , im trying to write more in english although i have always the translator in the side bar. This is definitely a perfect fall outfit! Love the classy dress and oxfords and pearls. Beautiful!